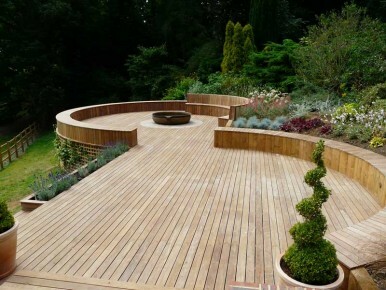 This timber decking in Godalming was on a steep sloping site and the project involved irrigation, lighting, seating and a sound system. Having completed some work for these clients ten years before, they returned to us having been inspired by a trip to India. They had a tight deadline, with 60 guests arriving for a 50th birthday party just 8 weeks after the project was proposed. We even had a bespoke raised Indian fire bowl flown in from India at short notice! Needless to say, the party was a huge success.